Aluminum armchair with Black wood effect slats. Suitable for outdoor commercial use and available from stock for a free and fast delivery. Delivered assembled and ready to use. 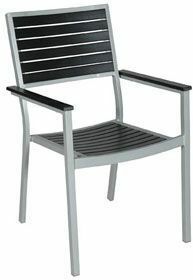 Aluminium frame arm chair with black or teak effect slats on the seat, back and armrests. These chairs are suitable for outside use for commercial environments.